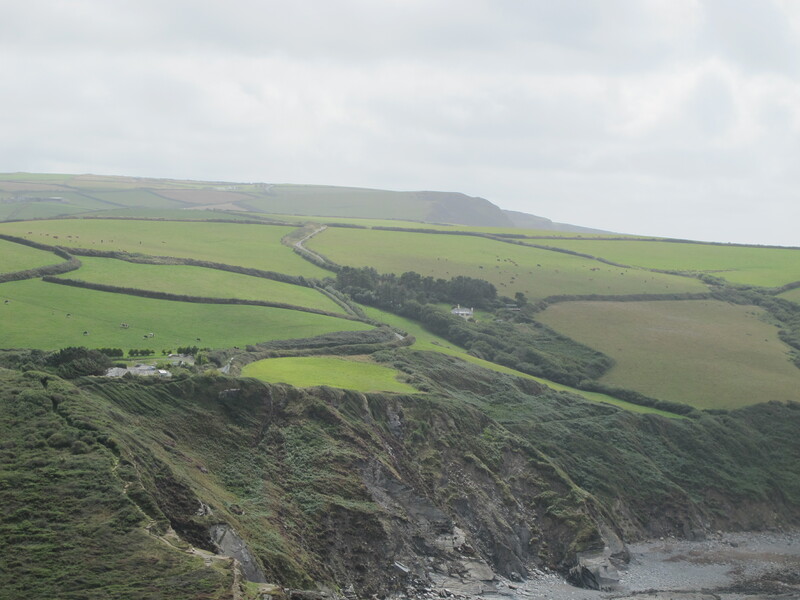 Gardening | Notes from the U.K.
Cornwall’s rich in wildflowers. And that’s good, because wages in the county are low, so it’s good to be rich in something–even something that doesn’t pay the rent. In response to a recent post, Dan Antion asked me to say more about one of them, alexanders, which he noticed in a recent irrelevant photo. Breaking all my self-imposed blogging rules, I’ll repeat the photo below, even though it’s now relevant. Alexanders tend to grow near the sea, because (according to Collins’ Wildflowers) they’re “probably more sensitive” to frosts. Probably? Doesn’t the author know? He’s writing a plant book. He’s supposed to know this stuff. And more sensitive than what? Tropical lizards? Never mind. We’ll have to settle for learning what we can here, then moving on. Why is celery capitalized? Because it’s a Plant and this is a Plant Book and it’s not uncommon in British English to capitalize Words in the middle of Sentences. Especially when they’re Nouns and strike the Author as important. ( I so want to capitalize important, since it’s important, but it’s not a noun, so I’ll restrain myself.) I don’t think it’s the approved style—newspapers and books don’t mess around that way for the most part—but if you get out into the real world, where the rules of grammar and punctuation and all that other good stuff don’t necessarily apply, you’ll find a lot of capital-happy people. It’s not that we don’t do strange stuff with the language in the U.S., but that doesn’t happen to be the strange stuff we do. Unless we’re talking about corporate or organizational writing, where suddenly all sorts of Committees and other nounish things get capitalized because they’re important and we don’t want anyone to forget it. Why does the quote read “a herb” instead of “an herb”? Because the British pronounce the H in herb, making it sound like the short version of Herbert. Okay, I’m not sure they have a shortened version of the name Herbert, I’ve never heard it, but then I’ve never met anyone named Herbert here. Why not? As far as I can tell, it’s because Herbert is slang for someone dopey and dull. I’ve never heard anyone say, “He’s a real Herbert”–in fact, I’ve never heard Herbert used as slang for anything–but that’s the sentence that popped up when I consulted Dr. Google. Any number of first names don’t cross the Atlantic, and some of the ones that do change genders in mid-ocean. But back to pronunciation. Americans don’t pronounce the H in herb, so it sounds like a city: an urb, just screaming for an N before the A. Actually, none of that is on topic. We’re talking about plants. Field Guide to the Wildflowers of Britain says the plant’s called alexanders because it’s “a herb of Macedonia, the country of Alexander the Great.” In the seventeenth century, the seeds were sold by apothecaries to cure flatulence and snakebite and to warm a cold stomach. No, I don’t know what warming a cold stomach means either. Medical writing of that period doesn’t translate well to our understanding of how the body works. While we’re on the subject of things I don’t know, I don’t understand how dark green leaves make a white sauce. Maybe you serve them with a white sauce. Maybe they make you go color blind. The plant’s a member of the parsley family. For some reason, even one lone sample of the plant gets a plural name, as in “alexanders is very confusing.” But the Field Guide doesn’t capitalize random nouns, so let’s trust it on the pluralish name. 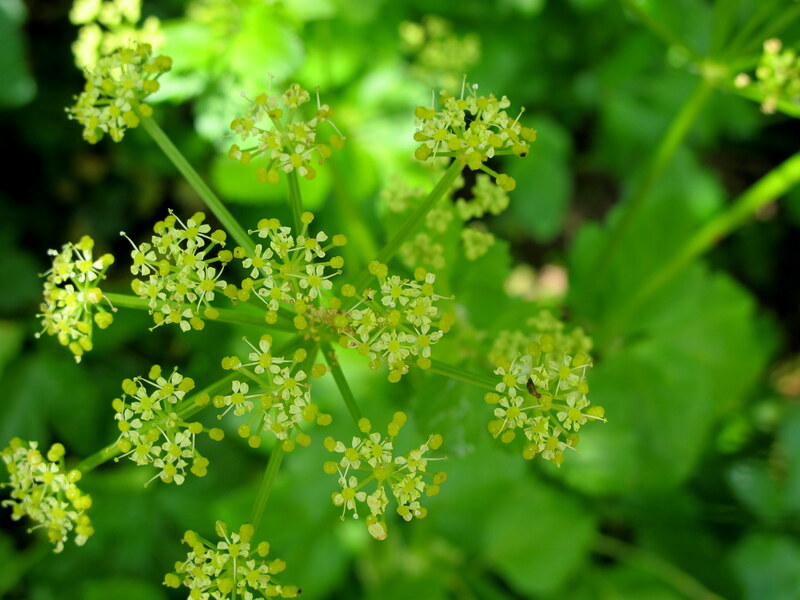 The Wildflowers of Britain and Ireland says alexanders were also called horse parsley, black pot-herb (from the color of the seeds), and heal-root. The Romans called it the parsley of Alexander (except of course they called it that in Latin, and that was especially useful since English hadn’t been invented yet) and brought it to Britain with them to use as both a spring vegetable and a medicine. It not only warmed a cold stomach (and I’m not sure if we’re talking here about the way the Romans used it or if we’re back in the seventeenth century), it expelled an afterbirth, broke wind (or, presumably, caused a person to, since being of the vegetable persuasion it couldn’t do that for itself), and provoked urine. Me? I’d be nervous about provoking urine. I’m not sure what it does once it’s mad at you. It also did a few other things—or at least it was believed to. 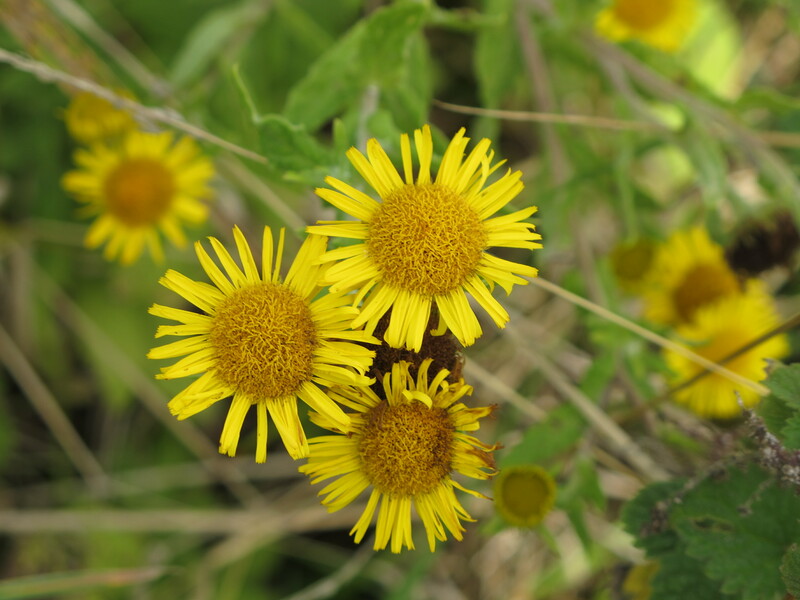 Sailors used to put ashore and collect it because it was believed to cure scurvy. I expect they were right about that, since they would have been highly motivated to observe its effect. It was popular in kitchen gardens until new varieties of celery were introduced. The tops can be pickled. All the books that address the question agree that if you’re eating the plant it should be cut early—before the buds open. So I’m too late to taste it for you this spring. And by next year you’ll have forgotten all about it. J. is a serious gardener, and she grows the best tomatoes I’ve eaten since I moved to the U.K. I don’t know how she kills slugs and snails on her patch in the spring, but I know she does, because if you’re going to grow anything around here, you have to. Otherwise they mow down every plant you stick in the earth. They move through like a scene from Slug Apocalypse, leaving nothing behind. A couple of us were at J.’s house and we went outside to admire the garden. It was that beautiful time of the evening when the sky’s a tissue-paper blue and you can almost convince yourself that the world is at peace, even though, yeah, of course you know better. Even though it was late in the year, she still had some flowers in bloom. On the edge of a flower bed was a slug. The big, creepy kind, easily the length of my ring finger. J. flicked it away—and I’d have to say she did it gently—with the toe of her shoe. “That’s why I don’t come out at this time of day,” she said. So it’s not just me. Everyone who gardens knows they’re out there. And at least for part of the year, we don’t look. If we did, as surely as if we’d sworn an oath, we’d have to kill them. And really, you can’t dedicate your life to eliminating an entire species, even if it’s only from a small patch of ground you call your own. One of my first posts was about slugs. I wrote it early in the growing season, when none of the new plants stand a chance unless I carry out mass slug-i-cide. And snail-i-cide. It’s disgusting, it’s disturbing, and it works, up to a point. But the plants that don’t get eaten get bigger, and sooner or later I convince myself that I can skip an evening’s slaughter. Maybe because it’s raining. Maybe because it isn’t. There’s always a reason, and it doesn’t have to be a sensible one. Then, before I notice what’s happening, several days have rolled past, and then the weeks do the same thing, and eventually I decide that I don’t have to kill them anymore. The plants are established. Oh, happy summer. I declare a truce with the slugs and snails. This isn’t negotiated, it’s a one-sided thing. They still eat everything in sight, but now I look the other way when I see them. Then summer passes, and right now it’s fall. Or autumn, if you’re of the British persuasion. A few days ago, I lifted the lid on the kitchen garbage can and found a snail glued to the underside. How did it get there? I suspect I found it when I was washing a batch of spinach I’d cut and I tossed it in as a sort of compromise: I won’t carry it sweetly back out to the garden to munch its way through more spinach, but I’m not killing it, am I? The reason I say “I suspect” is that I’ve rearranged my memory so that I’m no longer absolutely the kind of person who’d do that. I probably am, but I have a small escape hatch. The snail might have moved in on its own: come in the back door, crossed the living room rug, crawled up the side of the garbage can, lifted the lid, crawled in. You know; it could happen if, I don’t know, the laws of physics changed or something. I’m just not sure. I plucked it off the top and put it inside the bin again. Why? No idea. I don’t understand the workings of my mind any better than you, dear reader, are likely to. The next time I looked, it had climbed to the top of the liner and I left it there. Because by now it had become individualized. It wasn’t just some snail, it was almost a pet. And I’d tossed the poor thing in a near-empty, and dry, garbage can, with nothing edible and nothing moist. Stop that, I told myself. I didn’t listen. Instead I asked myself whether it was crueler to carry it to the pavement and crush it or to leave it where it was. This was, in spite of its absurdity, a serious ethical question, and a complicated one, which (like so many serious and complicated ethical questions) I haven’t answered to my own satisfaction. That’s another way of saying that I left it where it was but became conscious of every bit of edible junk I tossed in, and every smidgen of moisture. I made a batch of oatmeal chocolate chip cookies, which involved a lot of oatmeal landing on the floor. My recipes are like that: Take one handful of rolled oats and toss over your left shoulder. So I swept the oatmeal up and threw it in with the snail. Ditto the bits of dog treats I cut in half because the dog is small and the treats are big and she’d be chewing for half an hour if I didn’t cut them up. So here I am, the bane of slugs and snails, feeding a pet snail. Eventually the garbage can will fill up and I’ll take the bag out, slug and all, and toss it in the trash. I know this. But like a mother who can’t bear to tell her daughter the goldfish died, I’ll tell myself it’ll be fine. It’s just going on a trip, darling, to a new home. Summer evenings here in Cornwall are long and beautiful, and when night falls you’ll find me outside with a flashlight and a pair of scissors, slaughtering slugs. I can’t begin to tell you how romantic it is living in the countryside. Like something out of a Victorian novel. I snip the poor horrors in half, because otherwise they’ll eat my lettuce, my bean plants, my flowers, and just about anything else we grow. They glue their suckery undersides to leaves, flowers, twigs, and their dead co-religionists (dead slugs are a good source of protein, I guess, and the live ones aren’t sentimental), and they ingest every bit of that except the twigs, which they’ll need as ladders the next night to reach another meal. A slug. Photo by Peter van der Sluijs. The first person who told me she snipped slugs in half was M. The name doesn’t tell you much, even if you live in the village, because every third person here is named M., but this particular M. is an expert gardener and a lovely and gentle human being, so it was hard to picture her doing that. I shuddered and said, “Ewww,” like a ten-year-old. But that was before I started gardening. You have to understand: The slugs here are the size of double-decker buses. Britain was once heavily forested, and people will tell you the trees were chopped down to make way for agriculture and to build ships and all that, but don’t you believe it. It was the slugs. Back in the golden age they ate the trees and now they’re reduced to attacking my lettuce. Our first spring here, I started trays of plants from seed and the first time I set them out overnight the slugs came through like a line of combine harvesters, leaving nothing but the trays and the soil and the little plastic tags noting what no longer grew in them. I’m not a stranger to slugs. We had them in Minnesota, but they were small, well-behaved slugs who nibbled but were too polite to gobble. Maybe it was the winters that kept them in check and maybe it Minnesota Nice—that cultural thing that makes Minnesotans say “that’s different” when what they mean is “if I see you do that one more time I’m buying a gun.” The slugs here? I’ve already told you: They’re not just carnivorous, they’re cannibalistic. What more do you need to know? I should tell you at this point that I’m a vegetarian and that I don’t run around slaughtering things for fun. But I’ve come to understand that it takes industrial-scale slaughter to get in single leaf of lettuce to the plate. And if you’re growing your own, it’s up to you to do the slaughtering. Some of my gardener friends sprinkle slug pellets or set slug traps, and I’ve tried both. They helped but not enough. And some pellets go on to kill the birds and hedgehogs that eat the dead slugs. Others are marked organic and safe for wildlife, but even so gardeners who use them tend to whisper about it. I don’t know how the pellets kill, but I doubt the slug has a lot of fun in the process. Slug traps tend to use beer, and you could argue that they at least die drunk, so maybe they don’t care. The only method I haven’t tried is gathering them up and dropping them in salt water, where they fizz and die—or so I’m told. It sounds like a horrible death. Oddly enough, I do care about that. I’m a vegetarian. I have this habit of imagining myself into other creatures’ places. So if I’m going to slaughter something, I want to kill it as quickly and painlessly as possible. Even if it happens to turn my stomach. So come nightfall you’ll find me crawling around in the dark with my flashlight and my scissors. The snails are just as bad, by the way, but you can’t snip them. I put them on a rock and stomp them. Just like the heroine of a Victorian novel.